In Place of Austerity, Restructuring the economy, state and public services. 264 pages – Paperback £18.00 ISBN: 978 085124 7939 Spokesman Books, Nottingham. England. The Guardian Public Leaders Network Thursday 8 December 2011 Public sector workers must work together to prevent privatisation by Dexter Whitfield. 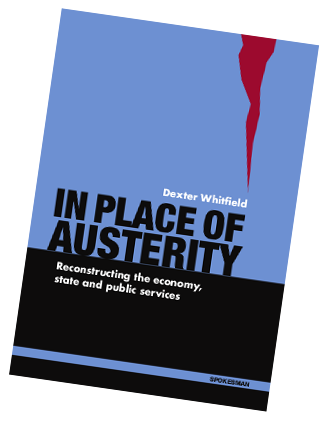 “In In Place of Austerity he sets out both to ‘develop a theoretical framework to better understand neoliberal transformation of public services and the welfare state’, and to offer campaign strategies and policy alternatives to this transformation. Whitfield is particularly strong on the role of the public services industry, which he says is more accurately labelled the ‘privatisation industry’ or, simply, the ‘big business lobby’. Published on 9th November 2011. Last updated 6th June 2017.